LB142, as originally introduced by Lincoln Sen. Suzanne Geist, would have updated legal definitions to mirror those adopted by the Society of Automotive Engineers in 2018. It also would have established legal liability for autonomous vehicle accidents. Geist introduced an amendment that would, if adopted, replace the original bill. 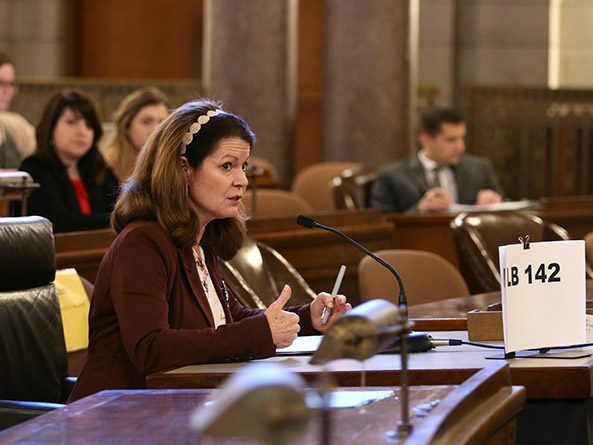 She said the measure would ensure Nebraska stays at the forefront of legislation aimed at encouraging innovation. “This protects consumers and manufactures by ensuring an autonomous vehicle means the same thing in Pennsylvania as it does in Nebraska,” Geist said. As amended, the bill would clarify who is legally liable in the event an autonomous vehicle is involved in an accident. If a human driver is in the autonomous vehicle during the accident, he or she would be legally liable unless the automated driving system is engaged. If the system is engaged, the manufacturer would be liable, unless the system has been modified by a third party. Before an autonomous vehicle could operate in Nebraska, the manufacturer of the autonomous vehicle and automated driving system must prove their financial ability to pay legal damages of at least $5 million, including minimum coverage of $1 million per vehicle, per occurrence. Julie Maaske, deputy director of the state Department of Motor Vehicles, supported the measure, saying it would allow the department to respond to technological changes in the market. “The key issue is the need to ensure innovation is not stifled while maintaining balanced oversight of [safety],” she said. Opposing LB142 was Leighton Yates, representing the Alliance of Automobile Manufacturers. He said the updated definitions proposed in the original bill were too narrowly crafted and would put Nebraska out of step with other states that have approved autonomous vehicle technology.